The 'We have a problem!' 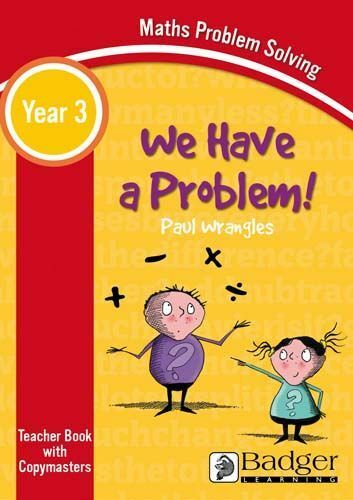 series is aimed at Key Stage 2 teachers who want to challenge and inspire their class with word problems in maths. If you want to take your pupils off auto-pilot and developing a sparky, thinking classroom, it's the resource for you! Why is this resource different? Focuses on the ‘skills behind the problem,' that sometimes get left behind in a rush to find the answer. Concentrates on 'how' your pupils reach an answer, rather than what it actually is. Through lively activities, 'We have a problem!' encourages your pupils to dissect word problems and see what they're really asking. Fun characters and activities that really liven up a lesson with kung fu blobs and Mexican waves ! Turns an area of maths that pupils have traditionally found difficult and uninteresting into something completely different! Paul has over 9 years’ experience of teaching KS2 in England and Wales and runs the Sparky Teaching website for teachers. A firm believer in making learning interesting for pupils and helping develop sparky teachers, 'We have a problem!' came out of Paul’s desire to challenge pupils to think about how they reach answers and to liven up the teaching of a subject that can rarely be described as lively!